This volume is the second edition of the highly successful Fractals Everywhere. The Focus of this text is how fractal geometry can be used to model real objects in the physical world. 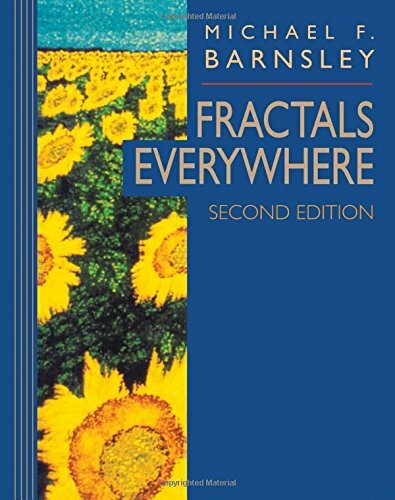 This edition of Fractals Everywhere is the most up-to-date fractal textbook available today. * A new chapter on recurrent iterated function systems, including vector recurrent iterated function systems. * Problems and tools emphasizing fractal applciations. * An all-new answer key to problems in the text, with solutions and hints. "The material contained in the second edition is quite obviously more extensive in detail and scope...the style of writing is technically excellent, informative, and entertaining... ."
"The problems and examples are well-chosen and interesting...difficult concepts are introduced in a clear fashion with excellent diagrams and graphs." 3. Fractals Everywhere Barnsley, Michael F.
4. Fractals Everywhere Barnsley, Michael F.